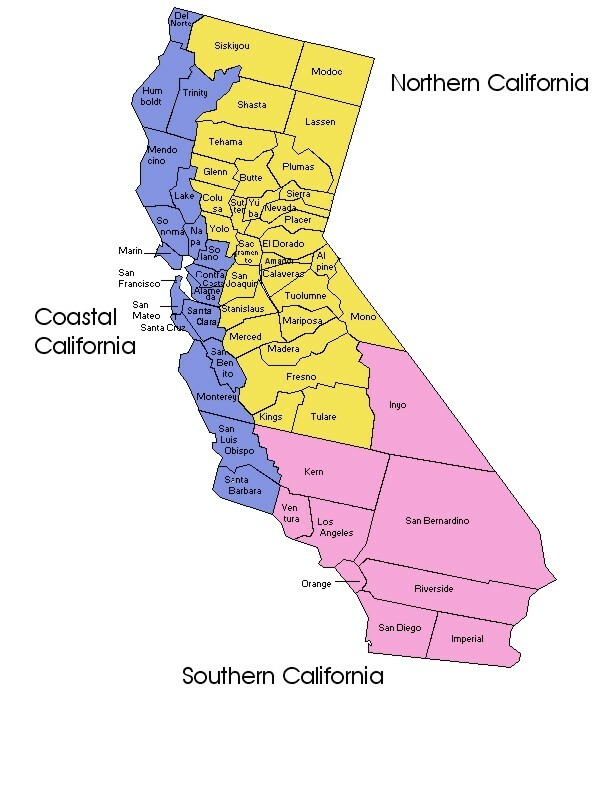 Before tackling the arguments associated with the pros and cons of dividing California, the issue of how many states to divide California into should be examined. One can't help but feel that Southern California is reasonably identifiable as a physically separate area from the rest of the State. The line to be drawn is not literally east-west or north-south. But some relationship probably exists between the physical and existing political boundaries. What about the rest of the state? Forget the old North-South split -- recent polling is reinforcing the notion that the new fault line in California politics is inland vs. the coast. "And it's a phenomenon that may be with us for some time,'' said Field Poll director Mark DiCamillo. 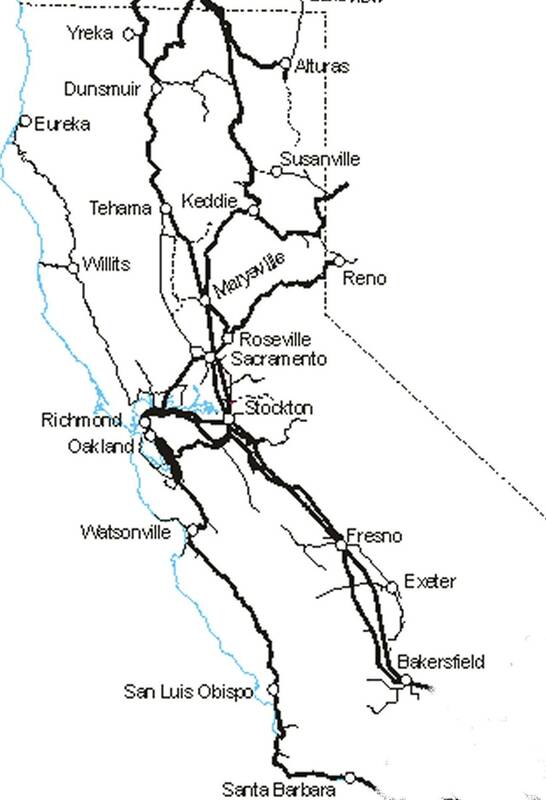 The emerging split pits the liberal and heavily Democratic coast against the more conservative and Republican inland areas such as Riverside and the Central Valley. And nowhere is the split more apparent than in this year's presidential race, where recent Field polling showed George Bush ahead by 20 points in the Inland Empire, compared with John Kerry's 17-point lead in the more populated coastal areas. -- Proposition 66, the move to roll back California's "three strikes" law. The latest polls show support for the measure is four times greater among coastal voters than inland voters. -- Proposition 72, to require businesses with more than 200 employees to help pay health insurance costs for their workers. On the worker-friendly coast, recent polls had the measure ahead by 6 points. But among the business- friendly and government-averse inland voters, the "no" side of Prop. 72 was ahead by 18 points. -- Proposition 71, the $3 billion stem cell initiative. It has a 20- point lead on the coast, but only an 8-point lead inland. "And this is going to be with us for many years," DiCamillo said. "The inland voters look like America's heartland, while the coastal voters look a lot like the Northeast." "The economy of the state of California, if it were a nation, would be comparable to that of the U.K. or China, and the President of California would be attending the G7 or G8 summit meetings. However, such a strong economy is not consistent across its regions. 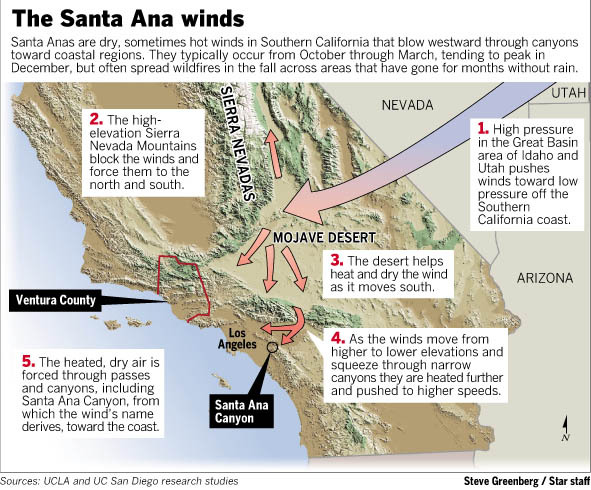 Based on geographic and economic activity..., we can divide California into three major economic regions and San Diego County: the...Central Valley, the...San Francisco Bay Area, the...Los Angeles region, and San Diego." In summary, the three major regions of California and San Diego have been recovering at different rates because of significantly different economies. 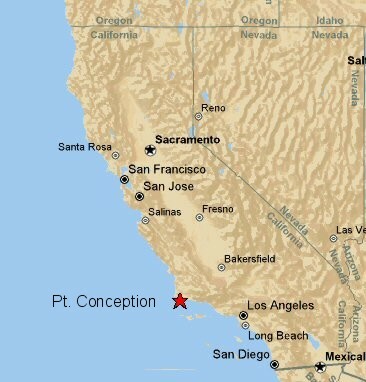 The Bay Area is a relatively stable region due to its well diversified economy. The Central Valley has been and will continue to be the fastest growing region in California due to availability of open space, lower housing costs, and absence of problems that hamper the larger coastal areas. But the Central Valley will continue to suffer from relatively high levels of structural unemployment. The Los Angeles area was hit hardest during the recession because of defense cutbacks and the resultant massive layoffs by prime defense contracting firms. Even though job growth in the Los Angeles area is at a faster clip than in the Bay Area, it will take longer for Southern California to regain its pre- recession job level. In the most recent recession cycle, Southern California proved to be more resiliant, the housing boom particularly protected the Central Valley while, as we all know, the Bay Area economy tanked. All this confirms that three separate economies exist. Currents and other bodies of water may differ dramatically in temperature and chemistry, as well as speed and direction. These factors all influence the kinds of marine life found in different bodies of water. 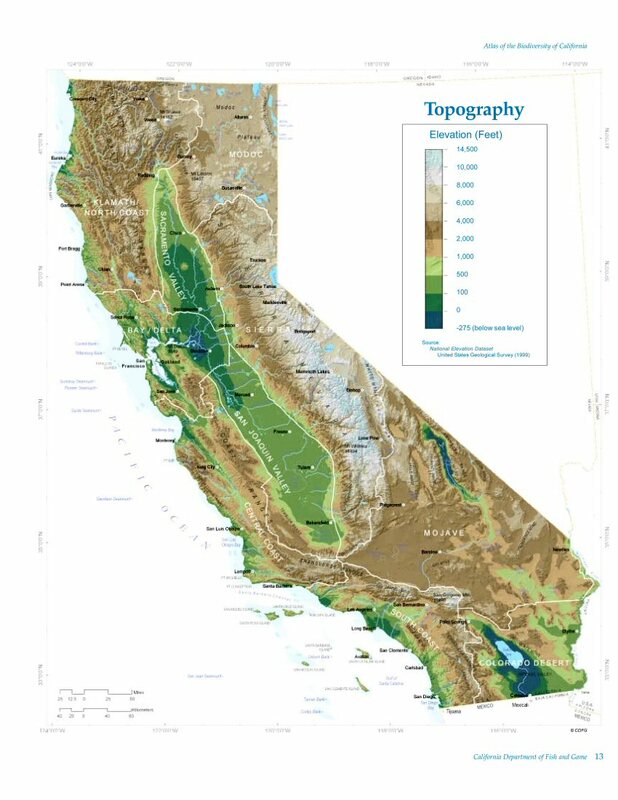 In general terms, geography, oceanography, and biology combine to divide California marine fisheries and other marine life into two major regions north and south of Point Conception. Within each region, other differences emerge. Conservation and use of California's marine life depends partly upon recognizing these differences. However, these details are not something that can be resolved on this web site. For statistical analysis, the map with undivided counties will be used. 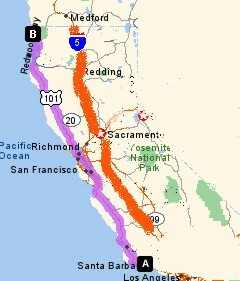 The last point to be taken up is that of limiting the split to three states. The political facts of life are that even with just three states Californians would gain four U. S. Senators, no small concern for the other states. 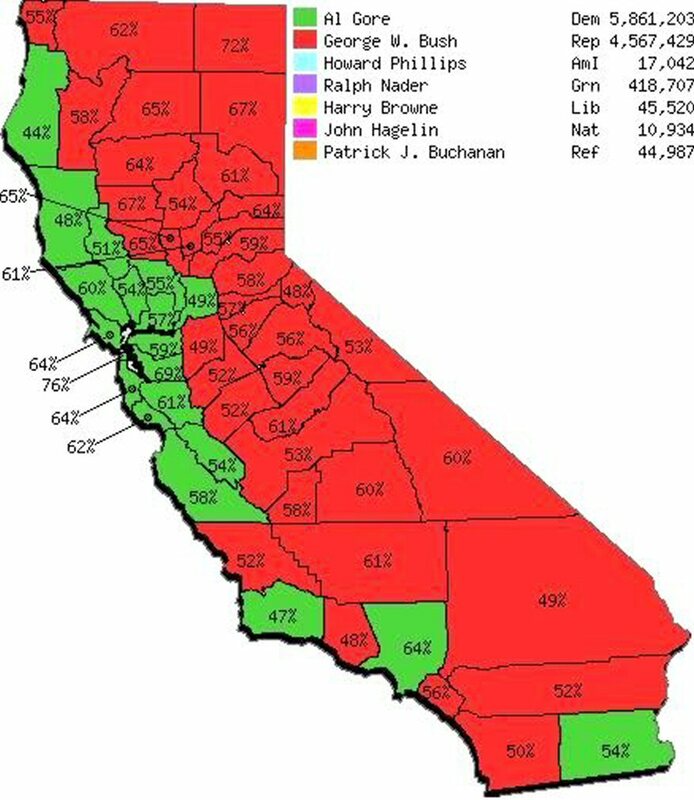 However, a division as suggested here as of 2004 would create four open Senate seats unless incumbents Diane Feinstein or Barbara Boxer relocated, for they both would live in Coastal California which would be the most liberal new State. The new Southern California and Northern California would likely present new opportunities for both of the two major parties with the real possibility that two conservatives and one or two moderate Republicans could take the seats. Of course, Democrats could take the seats also, but the point is that true opportunities would exist for both parties. This should make the idea more appealing in the current Congress. Political realities aside, the three new states would constitute "average sized" states when compared to the rest of the states. Let's take look at the new states that would be created. Click on the "Next Poppy" below.